Friday may 3 1907 I had churning to do and did the mending and put the clothes away. It snowed most of the day. Melting as it fell. Billy did not plow in the afternoon but went to town. I have so much work with my chickens. Saturday May 4 1907 I did a lot of sweeping and dusting in the morning and got the dinner. Will went to town twice for paint. I raked yard all afternoon he helped me some. The weather a little more pleasant. I was very tired and went to bed early. 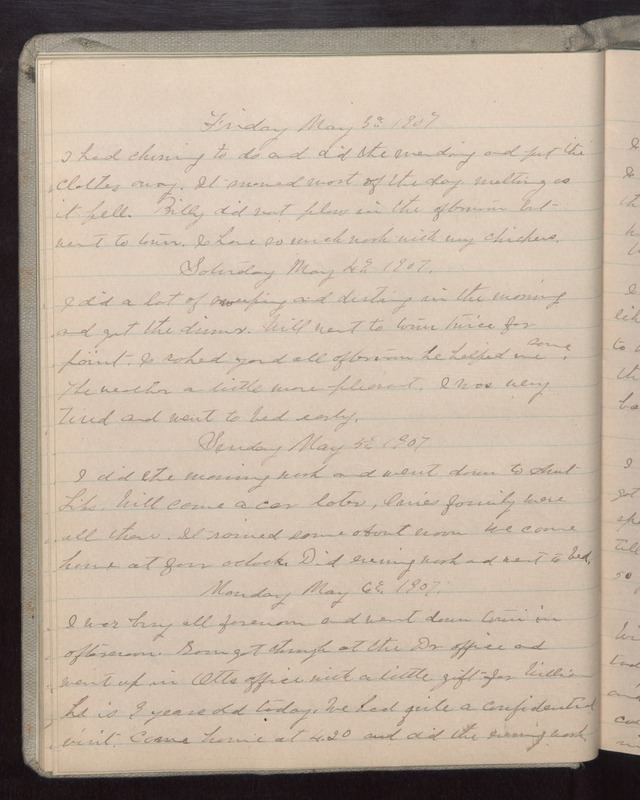 Sunday May 5 1907 I did the morning work and went down to Aunt Libs. Will came a car later, [illegible] family were all there. It rained some about noon We came home at four oclock. Did evening work and went to bed. Monday May 6 1907 I was busy all forenoon and went down town in afternoon. [illegible] got through at the Dr office and went upon Otts office with a little gift for William he is 9 years old today. We had quite a confidential visit. Came home at 4.20 and did the evening work.